Details: This is an excellent training and leisure in such a nice venue in Venice for those seeking the health and relaxation benefits of Tai Chi and Qigong with Grandmaster Chen Zhenglei. 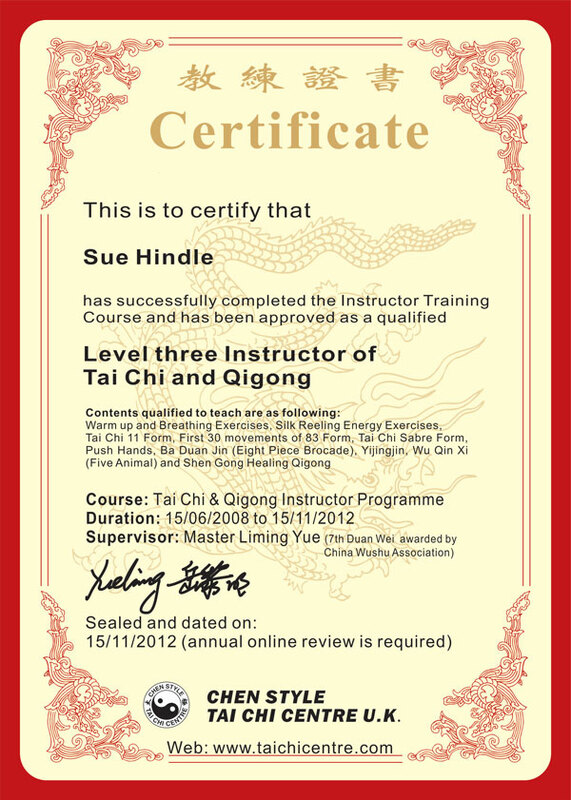 Chen Zhenglei Taijiquan Federation Instructor Certificate is also available to apply in advance. This is the first time to open to all Tai Chi instructors in the Europe. Grandmaster Chen Zhenglei will be on the examination Board and he will hand the invaluable certificate in person on the day. Please ask Master Liming Yue for details. Details: For details please refer to the additional information below. EVENT: FREE Tai Chi & Qigong live streaming Seminar in Altrincham Library! Additional 11 Form, Push Hands and Shengong seminar for Natalie & Paul: 10th June, Monday evening, starting from 7:00pm to 10:00pm and it cost £40.00; venue: Blakeney Village Hall (off the High Street), Blakeney, Gloucestershire. Please ring 01594 510666 or 07872161736. Details: The 5 Animal Qigong Form was created by Chinese Health Qigong Association based on the original Form from Chinese doctor - Huatuo, China. It consists of all features of stretch and Qigong energy movements for great health benifits. Additional Information: There will be a great opportunity to practice 5 Animal exercises in the Centre. Instructiional dvds will be available to purchase on the seminar. Accommodation: There are limited spaces in the Centre for students to stay during the seminar, First come first serve. Cheap Hotel Rooms are also available at Travelodge by booking 21 days in advance. Please contact Master Liming Yue directly. Additional Information: There will be an additional meal in a Chinese restaurant cross the road at 6:30pm, everybody on the seminar is invited. Bills will be shared on the table. Details: The Daoyin Health Qigong Form was created by Chinese Health Qigong Association based on the original Form from Daoism, in China. It consists of all features of breathe, stretch and Qigong energy movement. Additional Information: There will be a great opportunity to practice Daoyin Health exercises in the Centre. Instructiional dvds will be available to purchase on the seminar. Accommodation: There are limited spaces in the Centre for students to stay during the seminar, First come first serve. Cheap Hotel Rooms are also available at Travelodge. Please contact Master Liming Yue directly. Price: £150.00 for new indoor student (Advanced approval is requried. ); Free seminar to all existing indoor students. Details: The Ba Duan Jin Qigong Form was created by Chinese Health Qigong Association based on the original Form from Chinese antient Qigong exercises in China. It consists of all features of stretch and Qigong energy movements for great health benifits. Additional Information: There will be a great opportunity to practice in the Centre. Instructiional dvds will be available to purchase on the seminar. Accommodation: There are limited spaces in the Centre for students to stay during the seminar, First come first serve. Cheap Hotel Rooms are also available at Travelodge by booking 21 days in advance. Please contact Master Liming Yue directly. 12:00 PM - 1:30 PM; Sabre Form; additional £20 is applied. Details: The Liu Zi Jue Qigong Form was created by Chinese Health Qigong Association based on the original Form from Chinese antient Qigong exercises in China. It consists of all features of Breathing Qigong exercises with sounds movements for great health benifits. Details: This is a 83 Form weekend training seminar. All students who is interested in deep training are very welcome. Details: This is an energy training weekend. All students who is interested in deep training with energy releasing are very welcome. There will be an additional training on Friday evening from 7:00pm to 10:00pm and it costs £60. Sunday: 11:00 AM - 4:00 PM; Certificate will be issued later and we will pos it to you. Additional Information: There will be available to purchase Tai Chi Fan instructional Dvd on the course as well. Details: This is a specified intensive training programme designed for those Tai Chi instructors and indoor students of Master Liming Yue. All teaching will be broadcasting live during the seminar so taking participate over distance is also a smart option for those people could not attend the Centre. 2:00 PM - 6:00 PM; Tai Chi Form training and performing in the Centre; Meals at Hunan Restaurant after training and bills to be shared on the table. 8:00 PM - 10:00 PM; Social party night in the Centre, soft drinks and snacks will be provided by the Centre. 11:00 AM - 1:00 PM; Push Hands; Performing for Chinese New Year Celebration at Town Hall Albert Square and China Town in the afternoon. Details: The Chen Style Tai Chi 49 Sword Form was originated from Chenjiagou Village in Henan Province, China. It consists of all features of Tai Chi Form and it is the extension of the arms. The sword form was used for self-defense in a closed distance. Additional Information: There will be a great opportunity to learn sword form in the Centre (space is limited to 12 people). Instructional dvds will be available to purchase on the seminar. Accommodation: There are limited spaces in the Centre for students to stay during the seminar, First come first serve. Cheap Hotel Rooms are also available at Travelodge. 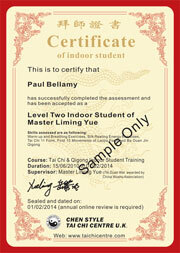 Please contact Master Liming Yue directly. Details: The Yi Jin Jing Qigong Form was created by Chinese Health Qigong Association based on the original Form from Shaolin Temple in Henan Province, China. It consists of all features of stretch and Qigong energy movement. Additional Information: There will be a great opportunity to practice Yi Jin Jing exercises in the Centre. Instructiional dvds will be available to purchase on the seminar. Accommodation: There are limited spaces in the Centre for students to stay during the seminar, First come first serve. Cheap Hotel Rooms are also available at Travelodge. Please contact Master Liming Yue directly. Details: The Chen Style Tai Chi 11 Form was created by Master Liming Yue based on the original Form from Chenjiagou Village in Henan Province, China. It consists of all features of Tai Chi Form. Additional Information: There will be a great opportunity to practice Tai Chi 11 form in the Centre. Instructiional dvds will be available to purchase on the seminar. Accommodation: There are limited spaces in the Centre for students to stay during the seminar, First come first serve. Cheap Hotel Rooms are also available at Travelodge. Please contact Master Liming Yue directly. There are no hidden costs and joining fees or uniforms. Students should just turn up the semianrs wearing loose comfortable clothing. Payment Terms and Conditions applied.